Before the final curtain is drawn on our lives, we can make environmentally friendly choices as to how our funeral and burial is conducted. When my mother passed away at the age of 50, it was an incredibly sad time. While I had experienced death through my work at a hospital, I had never been to a funeral – that process was a mystery to me. Her decisions as to what should be done with her remains reflected upon the way she led her life – humbly and always thinking of others. She requested that there be no embalming, no viewing, no monuments, a simple and small service, no flowers, a very simple casket and cremation. Her ashes were spread in places she loved in Australia and around the world. People overseas held their own small services to commemorate her. While my mother loved nature, I don’t know if her decisions were environmentally motivated. It was probably more a case of her not wanting to be a bother; bless her :). We were lucky enough to have an excellent funeral director and I learned a great deal during the process about how we treat our dead. Death in developed countries is generally not very environmentally friendly. It’s often a reflection of our lives as consumers. While a funeral is an important part of the grieving process for those of us left behind, there’s much we can do to have less of an impact on the environment when we pass on. Cavity embalming – internal fluids removed and more embalming chemicals placed into cavities. Hypodermic embalming, more embalming chemicals under the skin where required. Surface embalming in cases of viewable injuries. Cosmetics may also be applied, also fragrances. Embalming fluid is usually made up of formaldehyde, methanol and ethanol. Formaldehyde is carcinogenic and a common environmental pollutant. Do you really wish for this to happen to your body? Is a viewing necessary? I’m not criticizing if you do; but these are aspects you may not have considered. Then comes the casket or coffin – aside from being horribly expensive and the energy used to create elaborate coffins, they are often made with various plastics, varnishes solvents and glues, with some even being lead lined. Coffins made from particle board also contain formaldehyde. These chemicals leach into the surrounding soil and in the case of cremation, can release dioxins, hydrochloric acid, sulphur dioxide, carbon dioxide and other chemicals. The funeral itself can be an elaborate and resource intensive affair with flowers, motorcades and people travelling from all points of the globe to attend. Burial is also taking up increasing amounts of land – acres and acres of marble slabs, headstones and not much else. Cremation has gained popularity in developing countries over the past couple of decades. It could be considered greener in many ways, but isn’t without its issues; particularly if a coffin is cremated along with the deceased. A great deal of energy is needed to cremate a body. Most crematoriums no longer use coal but natural gas or propane. However, the temperatures required are around 870–980C (1,598–1,796F) and the average time is around 90 minutes. Emissions from crematories include nitrogen oxides, carbon monoxide, sulfur dioxide, mercury, hydrofluoric acid and hydrochloric acid. For the environmentally conscious person concerned as much about the impact of their death on nature as they are of their life; many funeral directors are recognizing this and offering green funerals and burials. The body is placed into a cardboard box which is then slid into the coffin cover for the service. After the service, the cardboard box is removed and buried or cremated. The cover can then be reused. This option means less trees are used for making coffins, it speeds up the decomposition process and also decreases the amount of energy needed if the remains are to be cremated. 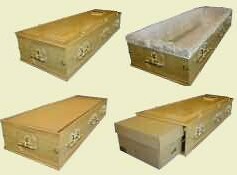 The coffin cover not only makes good environmental sense, but also financial – cardboard coffins cost a fraction of even the simplest solid wood caskets. The USA-made Eternity is constructed of recycled corrugated cardboard; with the interior fabric and wadding made from unbleached cotton. Even the grain finish of the casket is printed with soy based inks. 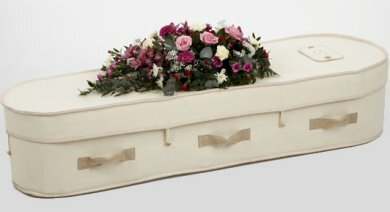 Another type of casket is the woollen coffin, made by Hainsworth in the UK. Handmade using British wool, the woollen coffin is supported by a frame made of recycled cardboard. The interior is lined with organic cotton, edged with jute and has a waterproof base that is also biodegradable. Other environmentally friendly caskets are made from cornstarch, bamboo or recycled paper. In the Middle East, a simple shroud is often used. Some funerals don’t take place until many days after the person has passed on. In some cultures, they must bury their dead within 24 hours – this means that bodies don’t need to be refrigerated for days on end and makes good hygienic and environmental sense. If you make your funeral arrangements well in advance, it may be possible to shorten the length of time between your passing and internment or cremation. For the service, you can state that you don’t wish for flowers, but request that money that would have been spent on flowers be donated to charity. As for a resting place, natural burial grounds are now springing up in many countries. These are usually woodlands, forests or reserves. Large monuments aren’t permitted to be erected, just simple plaques – you basically blend in with the environment. A company in Australia has taken the natural burial a little further. Upright Burials places the body in a vertical position in a biodegradable body bag; which it says is a far simpler and safer approach that removes the occupational health and safety issues and labour costs associated with traditional horizontal burial. I guess in that scenario, all you would need is a suitably sized post-hole digger rather than heavy duty earth-moving equipment. There are no grave markers at the cemetery site – the name of the deceased person is recorded on a memorial wall, and the next of kin is provided the exact location of the individual grave site. As mentioned, cremation isn’t without its problems environmentally speaking – but there’s now an alternative called “Resomation”. Around the same cost of cremation, resomation is a water/alkali based alternative with significant environmental benefits according to the creators of the process. It reportedly uses less energy than cremation, generates less carbon dioxide and avoids mercury and other harmful contaminants being pumped into the atmosphere. It is supposedly an accelerated form of natural decomposition chemistry. The ash produced instead being like the color of fireplace ash, is pure white (not that it really matters). While a traditional wood coffin can’t be Resomated, a coffin can act as a temporary casket and the deceased is contained in an “silk coffin” inside, which are then resomated. It’s an interesting process that is still undergoing approvals in various countries – you can learn more about resomation here. As in life, we can approach the sensitive issue of our death with green issues close to mind. – but be sure to discuss your wishes with your family and make prior arrangements wherever possible to help minimize the stress on your loved ones after you have passed on… it’s something I certainly need to formalize!